In a series of explosive comments about the mass shooting in New Zealand’s mosques, Turkish President Recep Tayyip Erdogan said that anyone who comes to Turkey with anti-Muslim sentiments would be sent back in coffins, “like their grandfathers were” during the World War I Gallipoli campaign. Australian Prime Minister Scott Morrison summoned Turkish Ambassador Korhan Karakoc on Wednesday to denounce Turkish President Recep Tayyip Erdogan for his comments following a deadly mass shooting at two mosques in Christchurch, New Zealand on 15 March. “Remarks have been made by the Turkish President Erdogan that I consider highly offensive to Australians, and highly reckless in this very sensitive environment. They are offensive because they insult the memory of our Anzacs and they violate the pledge that is etched in the stone at Gallipoli. I do not accept the excuses that have been offered for those comments”, Morrison said. “I will wait to see what the response is from the Turkish government before taking further action, but I can tell you that all options are on the table”, Morrison continued, stressing that Australia’s ambassador to Turkey will meet with members of Erdogan’s government later in the day. He also pointed out that Canberra was also reconsidering its travel advice for Australians planning trips to Turkey. 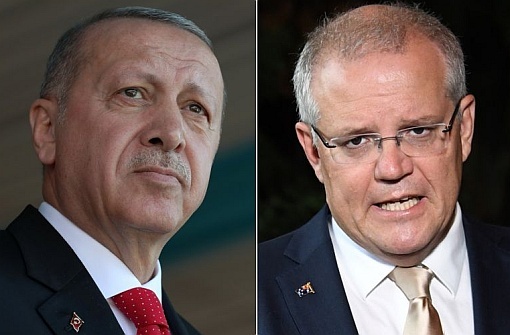 Morrison’s remarks came in response to Erdogan’s fiery speech at a campaign rally, where he blasted New Zealand and Australia for sending troops to Turkey in the World War I Gallipoli campaign, suggesting that their incentive was anti-Muslim-oriented. “What business did you have here? We had no issues with you, why did you come all the way over here? The only reason: We’re Muslim, and they’re Christian”, Erdogan was cited as saying by The Associated Press. Speaking a day before on the occasion of the 104th anniversary of Battle of Canakkale, also known as the Gallipoli campaign, Erdogan warned that anyone who arrives in Turkey with anti-Muslim sentiments would be sent back in “caskets”. “They are testing us from 16,500 km away, from New Zealand, with the messages they are giving from there. This isn’t an individual act, this is organised. […] Your grandparents came here… and they returned in caskets. Have no doubt we will send you back like your grandfathers”, Erdogan said.